Scholars have been saying for that past decade that the death tolls from the Civil War, America’s most destructive war, are actually far higher than previously figured. They are saying that the commonly accepted number of 620,000 deaths should be more like 750,000…how do you think this will effect future Civil War research? 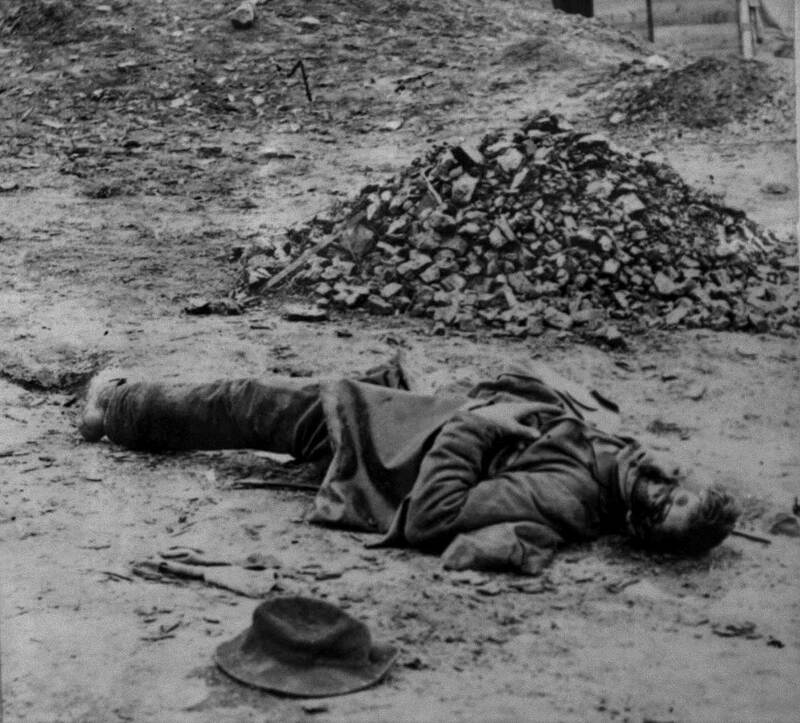 A dead soldier in the trenches at Petersburg. Not just a statistic. I am a Civil War buff to the highest degree possible. I study, read about, visit places pertaining to, and collect artifacts from the civil war. I know that there are hundreds of thousands of people like me in this grande nation. But as history buffs, historians, teachers, and students do we really know what the war was like? Can we feel the same emotion felt by the “characters” in the heat of battle or in the warmth of the campfire? Do the deaths of 620,000 men hold the proper signifcance for us? One of the most important ways, I believe, to really understand the war is to study the deaths caused by it as more than just numbers or statistics. I am currently reading the book This Republic of Suffering written by Drew Gilpin Faust. 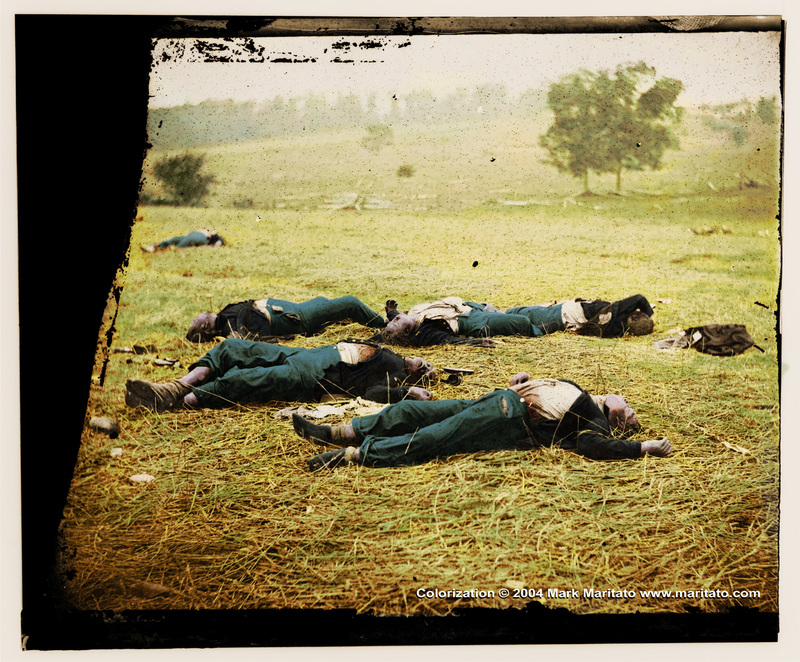 It is an in depth look at death in the American Civil War. It presents the Civil War in a new light. It is ,at times, a rather gruesome yet unavoidable and unforgetable look into death, killing, burial, and the aftermath of battles and the war itself. It produces a glance at an issue that is skirted around by many books and authors because of the sheer gore and graphicness involved. I personally believe this is an issue that should not be “skipped over” because death and the fear of it was felt so keenly by all who participated in the Civil War and even by those citizens who lost a son, brother, husband, or father. 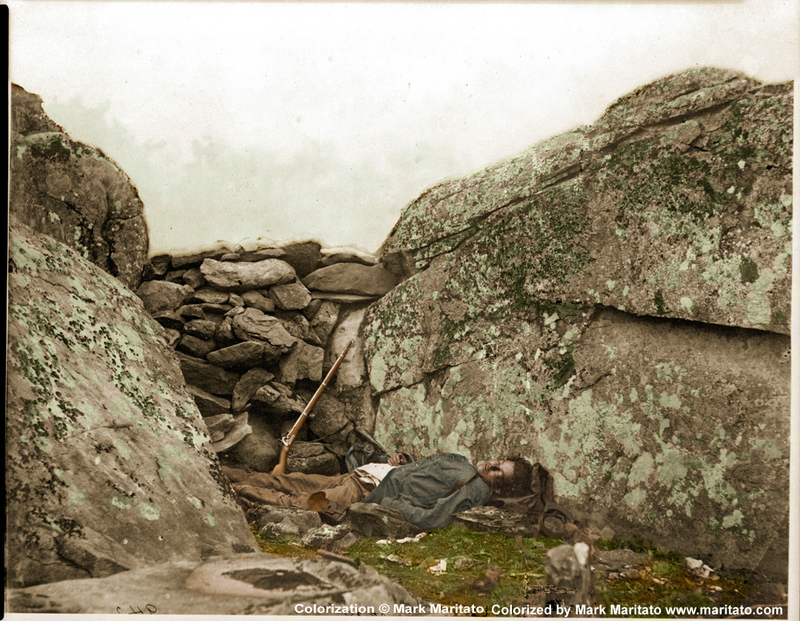 To get a grasp on what was really felt, to get a grasp of some of the true emotions of the Civil War, one must study death. witness it. 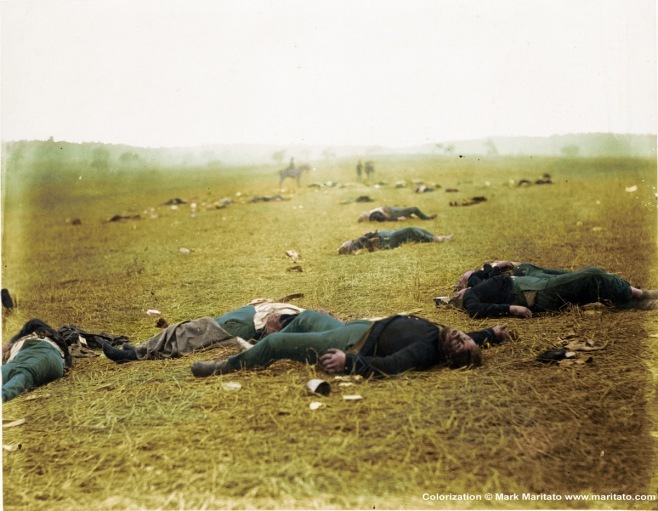 A Connecticut chaplain put it very well when he said, “To say that two thousand or twenty thousand men are killed in a great battle or that a thousand of the dead are buried in one great trench ,produces only a vague impression on the mind at the fullest. There is to much in this to be personal to you. But to know one man who is shot down by your side, and to aid in burying him, while his comrades stand with you above his open grave is a more real matter to you than the larger piece of astounding information.” This illustrates the saying by Joseph Stalin ( I loath to quote such an evil man) “a single death is a tradegy; a million deaths is a statistic”. I think that if we, as students of the Civil War, want to really understand it we need to look at the grisly, terrible side of the war. We ought to look at more than just the overview of the war, more than the statistics. The personal stories and sadly, more often than not, the deaths of the individual soldiers and civilians in the war. While Jesus was the most important baby ever, all I mean ALL other babies are important. To kill or abort one is just as awful as killing a fully grown person. This documentary talks about the value of life, abortion, and other important issues. economy, the effect it had on the family, and how it tore our nation apart. These are great books that tell incredible and very sad stories. The best look you could ever get though on slavery comes from those who experienced it themselves. The best view on any issue comes from those who were there, those who experienced it. Slavery was hard in every aspect and every possible way for those held under its sway. There was always a lack of food, clothing, and the normal human comforts that you and I take for granted. The lack of food was felt by all. Many times slaves would go without a meal and would have to work all day.Mary Ella Grandberry, a slave who labored in Alabama said that “Plenty of times us had to go withouten breakfest, ’cause we didn’t get up in time to get it before the man done come to get us on de way to de field. Us worked until dinner time just de same before we got anything to eat.” Slaves where “property” and the plantation owners knew that. Slaves were valuable and it would often cost up to $1,200.oo for a male slave. Even the most cruel of masters would not completely starve his “property” The average master did not over-feed any of his slaves by any means though. According to Robert Glenn, a slave in North Carolina “The food was generally common hog meat and corn bread most all the time.” One slavewoman named Sarah Gudger remembered what she ate as “jus’ a li’l corn bread and a li’l ‘lasses [molasses]. Lord, you can’t know what a time I had.” A woman named Mary Reynolds, who was a small girl during her slavery years, found a way to add more sustinance to her meager diet. She said that “when I could steal a ‘tater, I used to slip it into the ashes, and when I’d run to the fire I would take it out and eat it on the sly.” “Taters roasted in the ashes was the best tastin’ eatin’ I ever had.” She said. A common Civil War era slave cabin. roomed cabin. Sometimes slave families would have up to 8 children thus making it very difficult to live in a one roomed cabin. 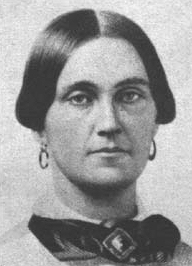 John Finnely described the cabin he lived in, “Us have de cabins of logs with one room and one door and one window hole, and bunks for sleepin’.” Fannie Moore described her slave cabin also, “De quarters just long row of cabins daubed with dirt. Everyone in de family live in one big room. In one end was a big fireplace. Dis had to head de cabin and do de cookin’ too.” Living quarters were cramped and often inadequate. Slavery was an all around hard time for many, many people. These two areas are not the only things that made slavery intollerable to an entire race of men. In part 2 of this post I will discuss the mental anguish caused by the thoughtless seperation of slave families and the physical torture inflicted on slaves by their masters and overseers.